1. Cell phone use is not permitted in the restaurant: this is just as well since the happy din of the place would make it virtually impossible for you to hear anything being said on the other end of the line. 2. Though world famous as a haven for offal enthusiasts, the most recent menu at St.John’s made a dessert lover such as myself smile from ear to ear: in addition to eight appetizers and seven mains, there were–count’em- thirteen desserts (fourteen, if you pay the extra £3 to upgrade your freshly baked madeleines from a six to a twelve pack. Allow me to say that the latter is the way to go). 3. In true French bistro style, the wine list is eclectic, full of wines from sleepy little appellations and less than famous producers, with a few exceptions. And also in typical bistro style, the wine service is unpretentious, as is the stemware, which was not exactly something to write home about. On this evening, my meal at St.John’s started off with a hot lamb broth that could have used an extra dash of salt and pepper, but was hearty and satisfying, while the Jerusalem artichoke preparation was rich and complex. The friend I was dining with chose to eat ox heart, something I’m not too keen on, but it was well cooked and lifted by a robust helping of greens. 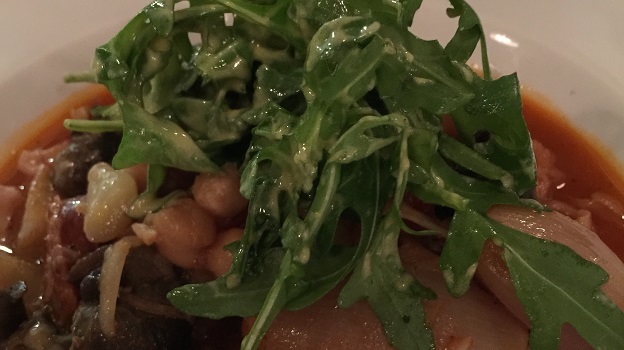 The snail, chorizo and chickpea stew was a spicy standout, truly country and winter fare at its best: I loved it, and thought it the best dish of the night, by far. And what to drink with such robust food? 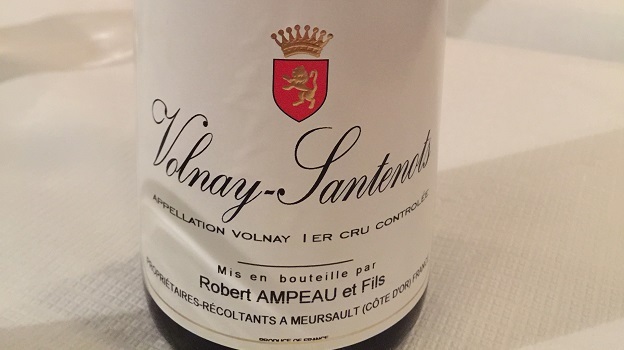 A bottle of the 1976 Robert Ampeau Volnay Santenots turned out to be just what the doctor ordered. Ampeau’s wines develop at a glacial pace, and this beauty was no exception. Youthful red in color, it offered bright red cherry and floral aromas with more spicy (however closed), brooding flavors on the palate. The red cherry and dark berry fruit were shrouded beneath a very firm but polished cloak of tannins. As the wine was still closed and unyielding, with noteworthy but balanced acidity providing freshness and lift, it seems to be frozen in time, floating in some sort of vinous (no pun intended) suspended animation. The terroir of Santenots (characterized by a thin, red, iron-rich, heavy clay soil lying just above subsoil of hard limestone) tends to result in bigger wines than is typical for Volnay, so it’s more than likely Ampeau’s winemaking style and the nature of the 1976 vintage (a hot, dry summer led to powerful, tannic wines) that account for this wine’s personality. Impressively, this remarkably youthful wine exhibited no roasted or cooked aromas and flavors, and matched extremely well with the lamb broth, the stew and the heart preparations. When I finally got up from my seat, thankful for both the food and wine, I found myself already looking forward to my next visit to St.John’s.